Last Updated: Mar 7, 2019 @ 7:03 pm. After researching and reviewing 87 different crib brands, we pick the DaVinci Kalani crib ( $179.00) as the Best Baby Crib 2019 (full-size). Scroll down for our picks for Best Budget-Friendly Cribs, Best Crib for City Dwellers and Best Eco Baby Crib. New to crib shopping? Read our 7 Things No One Tells You About Buying a Baby Crib for advice and tips. An excellent crib should be affordable, easy to put together and safe—from a company that has a strong safety track record in this category. We also prefer cribs that are third-party certified to be low emission (that is, the stains or paints used to finish the crib don’t emit any volatile organic compounds.) A variety of colors is also a nice plus. The DaVinci Kalani crib hits all the right notes—made of New Zealand pine, the Kalani is $179.00 on Amazon. We found this crib easy to assemble and use. It has four different configurations: toddler bed, daybed and full-size bed. As with most convertible cribs, you don’t get those four different uses out of the box. The toddler rail is a $69.00 accessory. And the conversion kit to turn the crib into a full-size bed runs $89.99. The Kalani crib is GREENGUARD GOLD certified to be low emission. That means it is third-party tested to be free of 260 VOC-emitting chemicals. The Kalani is imported from Taiwan. We like the little touches DaVinci has added to the Kalani—note the design detail at the feet and the SEVEN color finishes, including trendy colors like black and grey. Most cribs in this price range have just two or three finish options. DaVinci is part of the Million Dollar Baby furniture company, which has a very good safety track record in the crib and nursery furniture category. Read more about Million Dollar Baby here with our in-depth review. The Kalani has a metal spring platform, which we prefer. Other similarly priced cribs sometimes have MDF or solid wood boards. So what are the downsides to the DaVinci Kalani crib? Since the crib is made of pine, it can be easily scratched or damaged (example: if you rub a belt buckle against the side rail). While we found the Kalani to be easy to assemble, a minority of online reviewers disagreed, citing the large number of parts needed to assemble the crib (the headboard on the Kalani has four separate pieces, for example). We see that point, but the Kalani isn’t that different (number of parts-wise) compared to other similar style cribs. Bottom line: the DaVinci Kalani crib is safe, easy to assemble and a great buy at under 200 bucks. Available in seven colors, the DaVinci is an excellent safe crib at an affordable price point. Not that’s not a typo—this simple Union crib (made by Million Dollar Baby/DaVinci) is this affordable! Is it a good deal? See our review below. The Union 3-in-1 convertible crib is sold on Amazon and made by DaVinci (part of Million Dollar Baby empire). The simple crib ( Check on Amazon) is made of New Zealand pine and style-wise echoes the simple IKEA Guillver crib. Fans of this crib love the easy assembly and metal spring mattress support. The value, of course, goes without saying—especially with most other cribs at chain stores running $200 to $300 or more. As for drawbacks, the claim here is that this crib has four uses—crib, toddler bed, day bed and full-size bed. 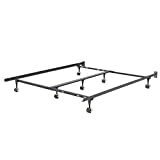 The caveat: the toddler bed and full-size bed require the separate purchase of a toddler rail ( $59.00) and a full/twin size bed rail ( $89.00; it’s actually a DaVinci full size conversion rail kit). And when converted to a twin or full bed, we’d bet the Union crib will look rather funky—that’s because the headboard and footboard are the same size. If you really want a convertible crib, the DaVinci Kalani ( $179.00) might be a better bet as it has a headboard that is higher than the footboard. (Perhaps in recognition of this limitation, Amazon now refers to the Union as a 3-in-1 convertible crib; they recently added a new Union 4-in-1 to the collection for Out of stock bundled with a DaVinci mattress). Visible screw on the Amazon Union crib—not a safety hazard, but some folks don’t like the look. A final drawback: this crib is made from New Zealand pine. As we explained in the Million Dollar Baby review above, this wood is soft and can easily scratch. Hence, take great care when unpacking and assembling this crib. Even rubbing a belt buckle against the crib rail will scratch it (when you lean into the crib to pick up baby, for example). We realize a chewed-on crib doesn’t look perfect, but having a baby in your house means everything will now be scratched, scuffed and chewed on—your crib will simply match the rest of your furniture. (“You can either have children or nice stuff!”—Dennis Miller). FYI: The Union crib comes in five finishes, including blue (lagoon) and yellow (sunshine), which is unusual at this price point. Typically, affordable cribs are offered in only one or two colors. The caveat to this is that we’ve noticed that Amazon has occasionally runs out of some of the finishes. So if you have your heart set on a particular finish and see it in stock, we wouldn’t wait to order it. Best Crib Made In the USA. Can you buy a safe crib for just $99? Yes, you can—the IKEA Gulliver is just $99. Best Budget-Friendly Crib (Basic). Another affordable simple crib is IKEA’s Gulliver at $99. No, that’s not a typo! A simple, modern crib for $99. The crib is just a crib—it doesn’t convert to a full-size bed, etc. Also: the Gulliver only has two mattress positions. Very simple, but well made. You can have any color for the Gilliver as long as it is white. FYI: IKEA has a few other crib styles that run $99 to $199 in a few different finish options. If you are into minimalist style, either of these cribs will fit the bill. Note that even though IKEA cribs are simple, they meet all U.S. safety standards. We’ve recommended this brand for years and readers agree—these are safe, good quality cribs. The Stokke Sleepi’s oval shape and wheels make it easy to move from room to room, a necessity if you live in a small space! Unfortunately, this one isn’t cheap. Best Crib For City Dwellers (and those with little space). If you live in the city, space may be at a premium. We have two solutions here, although both have drawbacks. Our best pick for cribs for city dwellers is the Stokke Sleepi. Norwegian juvenile gear maker Stokke pitches its oval crib as a “system” that grows with your child: the Sleepi morphs from a bassinet to a crib, then a toddler bed and finally two chairs . . . all for a mere $999.00. You can buy just the crib for $799.00 (without the toddler bed conversion kit). The Sleepi’s oval shape and wheels makes it easier to move through narrow doors. The Sleepi is 29” wide; standard full-size cribs are 30” and more. That may not sound like much, but it can make the difference between fitting in a doorway or not. Plus few cribs come with wheels these days, as the Stokke does. Also: you can use the Sleepi in bassinet mode for up to six months. The bassinet mode takes up just 26” in width. And the bassinet’s simple style wins fans for its minimalist aesthetic. So what’s not to like about Sleepi, excluding its steep price? Well, an oval crib requires a special oval crib mattress ($200); and oval crib bedding ( $29.00 for a sheet). As you might guess, choices are limited. We also noted that Stokke has struggled with quality control issues in recent years, as expressed by our readers as well as customer reviews posted to Amazon. As a result, we gave them an overall grade of B-. If the price and concerns about the Stokke Sleepi have you wishing for another alternative, consider plan B: a portable crib. About 10% of all cribs sold in North America are these cribs, sometimes called portable cribs, mini cribs, folding cribs and so on. As you can guess from the name, these cribs are narrower in both width (25” width versus 30” or more for full-size cribs) and length (about 39” vs 52”). Our top pick for portable crib is the Babyletto’s Origami Mini Crib ( $269.98). This simple crib folds away when not in use and comes with wheels to move it about a small apartment or condo. (Using the wheels is optional). Overall, we found the construction quality to be above average for this crib. The downside to the Babyletto Origami Mini Crib? Well, it does take a while to assemble (a few users complained it was over an hour). And the crib only comes with a one-inch pad; you should probably replace this with a mattress that snugly fits it (37 x 23.875 mattress), such as this one from BabyLetto sold at Target for $99. Here’s the biggest drawback to the Origami mini crib—and it’s the same drawback that affects nearly ALL mini crib: babies often outgrow them before they are old enough to go into a toddler or big kid bed. Babyletto says the Origami crib can’t be used “when a child begins to climb.” Well, a typical child will hit that milestone around six to ten months when they can pull themselves up to a standing position. Some mini cribs (but not all) have lower rails than a standard size crib—and that makes climbing out easy for infants under a year old. Hence, mini cribs are more like bassinet replacements. Keep in mind that most babies will use a crib for two or three years (and sometimes up to age four). And a crib is the safest place for babies to sleep. Yes, there are stories floating around out there that a small baby can make it in a mini crib to age 3, but that is the exception. So what happens when your baby outgrows a mini crib before their first birthday? Well, then you have to move to a full-size crib. Hence, you can use a mini crib as a bridge until you have more room in your apartment or condo . . . or you find living accommodations with more space! Bottom line: a mini crib can make do for a while, but you’ll be finding yourself purchasing a full-size crib as your baby nears one year of age. Our top pick here is certified eco-friendly and comes in three color combinations. Best Eco Baby Crib. Babyletto’s Lolly crib ( $399.00) is our pick for top eco friendly crib. This crib is made by an established nursery furniture company with a good quality track record. Babyletto is part of the Million Dollar Baby family of nursery furniture brands. The company has committed to making sure all its cribs are safe for your baby and the environment. Their cribs are made of New Zealand pine and are GreenGuard certified. GREENGUARD GOLD is an independent third-party certification that the nursery furniture item is low-emission—that is, emission of volatile compounds (VOC’s) which can contribute to bad indoor air quality. (Read more about GREENGUARD testing here). For the price, you also get a toddler rail included. The downside, this crib only converts to a toddler bed–no double bed for you. Another disappointment, the Lolly only has one matching storage option: a three-drawer dresser with removable changing tray. Despite these drawbacks, we think the Babyletto Lolly is the best eco-friendly crib option out there today! If you’d prefer to stick with a made-in-America crib, our top pick is the Nest crib by El Greco. Best Crib Made in the USA. El Greco’s Nest crib is our pick for the best made-in-the-USA crib. (FYI: 97% of all cribs sold in the US are made in Asia, mostly China and Vietnam). Based in Jamestown, New York, El Greco has been making furniture since 1975 but largely flies under the radar of the industry. Why? Because most of El Greco’s cribs and dressers are sold as private label offerings by Land of Nod and Room & Board (El Greco’s web site lists which cribs they make for each chain). Yes, the brand is also sold in a handful of furniture stores, but most are regular furniture stores, not baby retailers. The Nest crib comes in five finishes (shell, maple, cherry, walnut or white). So what are the drawbacks? Well, the Nest is a basic crib that doesn’t convert into a full-size bed like many other cribs in this price range. That makes the investment here steep. But if you plan to use this crib for more than one baby, you could justify the expense. FYI: If you like El Greco but don’t like the simple style of the Nest, the company sells a handful of other crib at Room & Board, a 16 store chain of modern furniture stores. If you don’t have one of those stores nearby, you can order El Greco cribs online at Room & Board’s web site. What if you don’t have that much money but still want an American-made crib? Unfortunately, there isn’t much beyond El Greco. Yes, there are a handful of modern furniture companies like DucDuc that make cribs in the US, but most of these are $1000+ and even $2000+. And we found El Greco’s quality superior to these alternatives. Expensive but unique, the Ubabub Pod crib is a guaranteed conversation piece. Clear acrylic sides have starburst cut-outs and the curved end panels set the Pod apart. Bonus: it includes a custom-fitted mattress. Best High-Style Crib. Ubabub’s Pod crib is a futuristic show stopper—yes, insanely expensive but wins our pick for best high style crib with its curved wood panels and acrylic sides with funky cut-outs. The detail and craftsmanship on this crib is something to behold. The Pod comes with a custom-fitted mattress and the conversion kit to turn into a toddler bed that looks like something out of a movie set in 2093. Distributed in the US by the Million Dollar Baby family of nursery brands, Ubabub (pronounced “uber-bub”) is actually based in Australia and sells its goods in both Oz and New Zealand. Ubabub has a good reputation for quality and a solid track record for safety. Road trip! For an easy-to-use travel crib, we like the BabyBjorn Travel Crib light. Comes in three colors, black, silver and the pictured pink. Best Travel/Portable Baby Crib. After evaluating and testing 17 portable baby cribs, we pick the BabyBjorn’s Travel Crib Light for Best Travel/Portable Baby Crib. While not the cheapest option out there, we judged this ultra-light play yard (which folds up like an umbrella and fits in a small carry case) to be worth the investment. Parent feedback has been universally positive. At 11 pounds, it is half the weight of a standard Graco Pack N Play. Overall, readers like the Travel Crib Light. Fans love the easy set up and break down, and note that the fabric is nicer than other similar travel cribs. The mattress is pretty thick for a travel crib and the light weight makes it easy to lug around. The only complaints: short parents may have a tougher time lowering baby into the crib and the exterior poles jut out at an angle, creating a tripping hazard. Yes, it is pricey, but if you plan to travel frequently with your baby it may be worth the expense. It’s simple, modern—and low profile. The Modo crib is a good bet for shorter parents. Best Crib for Short Parents. If you are under 5’5”, you may find reaching into a standard-size stationary crib challenging. Since most cribs sit a foot or two off the floor and drop-side cribs were phased out in 2011, shorter parents may find it difficult putting baby in a standard crib when the mattress in its lowest position. For those parents, a lower profile crib may be just the ticket. A good bet: babyletto’s Modo 3-in-1 crib (pictured) is made from New Zealand pine and is relatively affordable at . At only 34” tall, the Modo sits low to the ground making it much easier to put baby in and out of the crib. The Modo is available in six color combinations including two-tone options (white top with brown or grey base) that gives it a modern spin. We like the Modo’s GREENGUARD Gold certification that means the crib is low in VOC emission, as well as the four mattress levels. While Babyletto touts the Modo’s “3-in-1” conversion feature, the Modo only coverts into a toddler bed (the toddler rail is included, which is a nice touch). Hence, the Modo doesn’t convert into a full-size bed for older kids. It folds! It wheels away! The Dream on Me Portable Stationary Side crib is also affordable. A good pick for the grandparents home. Best Crib for Grandma’s House. The best crib for the grandparents must be easy to set up and take down. We suggested one of two options here: a portable crib like the Dream On Me 2 in 1 Portable Folding Stationary Side Crib hits all the right notes—easy to assemble, folds away for storage and is affordable. FYI: Dream on Me sells two versions of their portable folding crib: a full-size version and a mini-crib version. As you might guess, the mini version costs less than the full-size one—but we don’t recommend it. A mini crib that is only 38” long (versus 52” for a full-size crib). That means babies older than one year of age or larger infants may outgrow this crib before they are old enough to sleep in a toddler bed. Hence the key issue with any mini crib is safety—older babies (younger toddlers) can easily escape a mini crib. Not so easily in a full-size crib. Therefore, our second option here is a full-size crib that is easily to assemble. Yes, such cribs do exist. Our pick for this would be the Delta Canton crib ( $219.99; not pictured)—Delta includes all the tools (allen wrench) to make assembly easy. We evaluated cribs with hands on inspections, checking for quality and durability. We look for easy-to-follow instructions as well. We also gather significant reader feedback, tracking cribs on quality and durability. Besides interviewing parents, we also talk with furniture experts with years of experience with wood furniture. We’ve been rating and reviewing cribs since 1994. During that time, we have also visited manufacturer facilities and watched cribs during testing. While we don’t personally test cribs, we compare our reader feedback with tests done by organizations like the Greenguard and Consumer Reports. To come up with our ratings, we often tour manufacturing facilities. Here’s a shot from Dutailier’s factory in Saint-Hyacinthe, Quebec, Canada. Those are leather pelts about to be cut by a water jets, on the way to becoming a glider rocker in your nursery. Yes, water jets! We evaluate cribs with in-depth inspections, checking models for overall quality and ease of use—for example, adjusting the mattress height. We analyze both the wood products used to construct cribs as well as the hardware. We also gather significant reader feedback (our book, Baby Bargains has over 1 million copies in print), on long term quality and durability. Besides interviewing parents, we also regularly talk with retailers of nursery furniture to see which brands are most trustworthy and other key quality metrics. The reliability of nursery furniture companies is another key factor—we meet with key company executives at least once a year and occasionally visit factories as well (on our dime, by the way). Since we’ve been doing this since 1994, we have developed detailed profiles of major crib brands that help guide our recommendations. 7 Things No One Tells You About Buying A Crib! 1. Whether they cost $70 or $700, all cribs sold in the U.S. and Canada meet mandatory safety rules. Yes, you read that right—that crib at IKEA for under $100 is just as safe as the European designer model from a fancy boutique that runs $2000. Do cheap cribs have dangerous designs? No. Long gone are the days when you had to measure slats to make sure they were the correct distance. If a crib is sold in a major store or reputable online site, you can rest assured it meets current safety standards. Unlike other baby gear, safety standards for cribs are mandatory in the US and Canada. That said, we would suggest buying from an established brand name (we review top brands on this site, scroll below for links). Yes, some web sites sell cribs from obscure brands with little or no history in the U.S. The concern here is whether you’d be able to contact them to buy replacement parts. Or how would they handle a safety recall? 2. Almost all cribs sold today are imported from Asia. Yes, even those with Italian-sounding names. China and Vietnam are the two biggest exporters of cribs to North America. In fact, we’d estimate that 97% of the cribs sold in the U.S. are imported from Asia. The rest are imported from Eastern Europe (Latvia, Romania) with a smattering from Italy and Canada. And yes, there is a company or two left in the U.S. that makes cribs domestically (El Greco). We realize some parents are concerned about products from China, which has suffered various product safety scandals. For those folks, we recommend a crib or two made in North America (see pick here). Fair warning: this will cost you much more than an imported crib. 3. Cribs are sold a la carte. And require assembly. Yep, that is it. Crib mattress? Extra. Sheets? Extra. Fancy bedding decor? Extra. You get the picture. Obviously, some of these are required (mattress) and most are optional (besides sheets, just about everything else). And those extras (crib mattresses) can sometimes cost more than the crib itself. Just a heads up as you plan that nursery room budget! Not the size of the crib, but the size of your baby’s bedroom. Full-size cribs are all the same size: about 29” wide and 53” long. That’s the INTERIOR dimension of the crib. Cribs with fancy headboards or curved sides can be several inches wider/longer. Fitting a full-size crib into a tiny secondary bedroom (or urban condo) can sometimes be a challenge. We recommend some options for those who are space-challenged. And remember that the crib is just the start of your nursery furniture saga—most nurseries also have a dresser to store clothes. And perhaps a place to sit and nurse baby. Later you might want a desk and chair. Plan out space considerations before shopping. Where the baby’s crib should go in a nursery is another factor. The safest place for a crib is away from any heating or cooling source (ducts, radiators, etc). And you’ll want to keep baby’s crib away from windows and window coverings/blinds (cords are a strangulation hazard). Got a baby monitor as a gift? Keep the cord at least three feet from the crib. But remember this equation: more funky = more money. A round crib needs a special round mattress, round bedding, and so on . . . at prices typically much more than standard size crib accessories. 5. To convert? Or not to convert? Full-size cribs today come in two basic flavors: convertible cribs or not convertible. Non-convertible cribs (we call them basic cribs) are just, well, cribs. They don’t morph into other piece of furniture. As such, they are typically less expensive than convertible cribs. The four different configurations of a convertible crib: crib, toddler bed with rail, day bed (no rail for older toddlers) and then finally full-size bed. In the latter use, the headboard of the crib becomes the headboard of a child’s full-size bed. In order to do all this presto-change, you need (you guessed it) an extra “conversion kit” which includes bed rails to make a full-size bed, connecting the headboard and footboard. These kits range from $100 to $200 extra. And convertible cribs are more pricey than basic cribs—convertibles start around $250 and can easily soar into the $500’s. Homelegance twin platform bed with headboard. $139 on Amazon. The take home message: convertible cribs aren’t really money savers, but more of a choice in aesthetics. Confusingly, there are several variations on convertible cribs. Some manufactures say they are “convertible” when all they mean is you can take the side rail off and then have a toddler bed. Doh! That doesn’t count as convertible in our book. On the other hand, some crib makers include a toddler rail for free (the rail keeps a toddler from rolling out of the crib once the side rail is removed). There is no right or wrong answer when it comes to whether to buy a basic or convertible crib. Some considerations: if space is tight, remember that using a standard crib and then buying a twin size bed may make much more sense than a convertible that morphs into a full size bed (full size beds are 15” wider than a twin). Think about how the crib will look when converted. Is the headboard higher than the footboard? Most folks think that looks better than converted cribs where the headboard and footboard are similar in height, which is more common in lower price convertible cribs. Your choice, of course!
. If you plan to have more than one child, it might make sense to buy an affordable basic crib you can re-use from child to child. Then as each one outgrows the crib, you can move then into a twin bed (headboard or footboard optional, of course). 6. It may take 14 weeks to special order that fancy crib. Yes, we said 14 weeks. Not days. Weeks. There are three basic places to buy a crib: online, chain stores and specialty boutiques. Most online sites deliver in about a week. Chain stores stock many cribs, while some styles require two to four week lead times (to ship in from a distribution center). Specialty boutiques, however, are a mixed bag. Some do stock cribs for immediate purchase. Most, however, require you to special order. And that is where the 14 week wait can come in. Most specialty stores carry upper-end crib brands that cost $500 to $1500. Some of these brands require a wait of 8-12 weeks for delivery, with a few up to 14 weeks. And sometimes deliveries can be delayed (port strike? earthquake? Chinese new year? ), causing your furniture to go on back order for, say, 20 weeks. Plan accordingly! 7. Say no to . . . .
. . . used or hand-me-down cribs. Buy a brand-new crib to make sure it meets current standards. Here’s an antique iron baby crib, like many cribs lurking in relative’s basements and attics. Does it meet current safety standards. That would be a big fat NO! Crib safety standards have changed over the years—not more than a few years ago, cribs had drop-sides which were implicated in safety issues (sides detached, resulting in injuries and in some cases, death). These cribs were outlawed in 2011. We know well-meaning family members want to help you by dusting off that family heirloom your grandfather used in the “old days.” Or a friend has a crib in the attic from 1998 they are dying to pawn off graciously give you. Just say no—even a late-model crib can be dangerous if it is missing hardware or instructions. Buying new insures your crib meets current safety standards and has all its parts. Hi! I am so thankful for all the recommendations, especially since I’m a first time mom. I did want to comment that the Best Basic Crib is not available at Ikea anymore. The Sniglar crib is no longer available, but the Hensvik is. Unfortunately, they only have white. Could you make another recommendation for a basic crib that comes in more colors than just white. Thanks! Hi Liz: Thanks for using our site—–glad you found it helpful! Good question: Amazon’s Union crib is a simple, basic crib that ranges in price from $109 to $130 and comes in five colors: http://amzn.to/2whWsOb Hope that helps! The Pali Imperia Crib is discontinued and almost impossible to find in stock with toddler rails. It is extremely disappointing and frustrating that baby bargains’ pick for “best” crib choice is a discontinued one. Apparently this section was updated in July! I feel like this is a disservice to the readers! Hi Nisha: Yes, sadly, that crib is now discontinued. I see Amazon still has a few left in stock here: http://amzn.to/2vmu3tm Not sure about the toddler rail situation, however. We have just updated the Best Cribs section to change/update that recommendation. Hi! I love your book and website! It has definitely made all these decisions for baby gear so much less stressful for us. Do you have any other recommendations for cribs for short parents? Thanks! Thanks for reading our book! Glad you found it and the web site helpful! I love your website, but your crib article is not accurate. Please update your crib article to eliminate confusion for others. Thanks! Thanks for letting us know! You are correct—they changed that. The toddler rail was once included; now it isn’t. We have updated the review.